Successfully Added Portable WiFi Signal Jammer to your Shopping Cart. WiFi Signal jammer. Tha name says it all. This WiFi signal Jammer works on the 2.4 to 2.5Ghz frequency range and blocks all WiFi signals within a 10 Meter radius. Just like the cell phones of the 80's have now shrunk to the size of your palm, and with performance that exceeds every expectation. 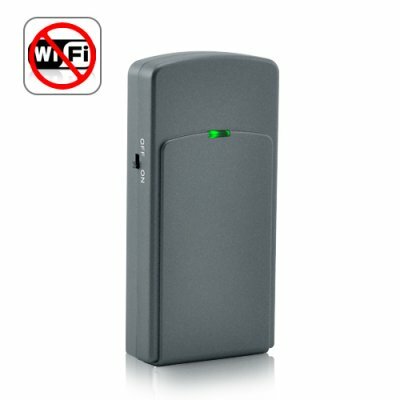 So are WiFi signal jammers beginning to reach the same level of ergonomic design in order to make their usability more convenient to the end user, and still deliver exceptionally on performance. Ultimate Convenience With the small and portable size, you can keep this device in your pocket, inside your bag, hidden under the seat of your car, anywhere! Also, with just an on/off button and green light to indicate the device is working, this Portable WiFi Jammer is simplicity at its best. You also don't have to deal with antennas to install or setting up any software/configuration, because this jammer is ready straight out of the box for instant jamming and unjamming. WiFi jamming is made more portable and affordable than ever before with our new Portable WiFi Jammer. Well-priced and well-built, this Portable WiFi signal Jammer offers powerful jamming for only a fraction of the price and size of famous, brand name jammers. Get yours now at an excellent factory-direct wholesale price, brought to you by the online leader consumer wholesale electronics - Chinavasion. Note: WiFi signal jammers may not be permissible to import into certain countries due to licensing of broadcast signals or other restrictions. Please check your country's telecommunications regulations before placing your order. Does this WiFi jammer pose any health risk issues? No, this WiFi Signal jammer is completely safe to use.